It seems like whenever a new zombie movie or season of The Walking Dead comes out, everyone talks about how the zombie genre has grown stale. The same old rotting flesh, the same old tired groans, the same old scares... But every once in a while, a film comes along that rejuvenates the undead apocalypse and breathes life back into the genre. The most recent movie to do this is Anna and the Apocalypse, the best Scottish musical zombie Christmas high school comedy you’ll ever see. Ok, let’s be honest, probably the only Scottish musical zombie Christmas high school comedy you’ll ever see. 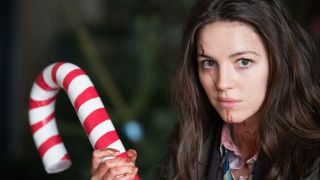 Anna and the Apocalypse is about a high-school girl (unsurprisingly named Anna), who wakes up on Christmas morning to find that the undead have risen. She’s faced with not only trying to survive her high-school drama (like her platonic best-friend who’s secretly in love with her, her smug bully of an ex, and her disappointed father who doesn’t want her to take a gap year before university), but also; zombies. It’s a brilliant yet simple story that takes its characters seriously and gives their mundane problems the same gravitas and urgency as the threat of flesh-eating ghouls. Sure, we’ve had zombie comedies before - and none have managed to top Edgar Wright’s Shaun of the Dead in my opinion - but Anna and her friends are not only funny, they’re relatable, and you’ll care deeply about their survival. “When I read the script I instantly fell in love with the characters and the heart of the story,” director John McPhail told me when I spoke to him about the upcoming movie. What’s special about Anna and the Apocalypse is that it clearly owes as much to zombie films as it does John Hughes’ work. Sure, the jokes about zombie celebrities are funny, but they work because we feel a camaraderie with this group of friends. The beginning of the film makes us care about the day-to-day teenager problems of the characters, so that when the zombies rise, and the blood begins to flow, the deaths feel genuine and hit hard. I honestly found myself on the verge of tears when the kids started getting savagely eaten alive. The other ace up the film’s sleeve is the music. Despite all reviews and promotional material stating otherwise, Anna and the Apocalypse is not the first zombie musical. As McPhail notes, that honour goes to Takashi Miike’s The Happiness of the Katakuris from 2001, yet Anna and the Apocalypse’s soundtrack is as memorable as any released in 2018 thanks to composing duo Tommy Reilly and Roddy Hart. The soundtrack is a delightful mix of catchy pop tunes, hilarious Christmas parodies, and a few surprisingly touching and heartfelt songs. Don’t be surprised if you find yourself tearing up a bit by the end, even if the first couple of songs have you wanting to stand up and dance. I still remembered most of the lyrics. It may not be the first zombie musical, but Anna and the Apocalypse most certainly is the first Christmas zombie musical. According to McPhail, the movie was originally going to be a summer graduation film, until Ryan McHenry – whose short Zombie Musical became the basis for Anna and the Apocalypse and worked on the film until his death in 2015 – decided to set it in Christmas. The juxtaposition of the joy of Christmas and the gore of the zombies makes for a wonderfully fun cinematic experience. It’s even better when the film plays on the clichés of the season, adding little twists you won’t see coming – the hypersexualized riff on Santa Baby had everyone in my screening losing their minds and cheering. You’d be forgiven for thinking that the different sub-genres are hard to balance, but Anna and the Apocalypse makes it look easy. It helps that McPhail isn’t your typical horror musical director, as he confessed that his favourite musicals are South Park: Bigger, Longer & Uncut and The Rocky Horror Picture Show (though he did see a lot of musicals while preparing for this film). Instead, he is a self-proclaimed horror fan, and the film certainly incorporates his love of horror cinema which sells you on its crazy premise. McPhail doesn’t try to explore all sub-genres at once, but gives the audience visual cues to let them know when the fun stops and the carnage begins. Christmas lights and music set the stage, while hinting at the next change in tone from a light teen comedy, to a funny horror comedy. And the last act exchanges the fun antics of the first half of the film for a gory, horrifying, and even sad zombie horror film that wouldn’t work without a deep understanding of the genre. There are bad zombie films coming out all the time, trying to make us dismiss the sub-genre as dead. But then along comes a film like Anna and the Apocalypse, with a deep love for the genre, great characters, and songs so catchy I’ve been listening to the only two currently available on repeat while writing this. Honestly, I will happily endure the next few terrible Night of the Living Dead copycats if it means we still get new gems like Anna and the Apocalypse. Find out what other films we think are the best movies of 2018 list with our countdown of this year's must-watch flicks, or get in the festive spirit with the best Christmas movies of all time.